At Honey Bee Palace Child Care Center, we understand that parents are looking for a “home away from home” when selecting a child care center; a place where your child will be safe as he grows, plays, and learns. We have done our best at creating just that environment in our infant classrooms, the Cacoons (0 to 6 months) and Caterpillars (6months to 12 months). In these rooms, we have designed a nurturing and soothing environment that is most conducive to your baby’s ever developing and growing needs. Each infant is unique and has his or her own pattern for eating, sleeping, and playing. Our teachers carefully observe each infant’s routine and then introduce a variety of daily activities that will help your infant develop his or her mind and body. Your infant’s daily events and activities, such as diapering, napping, and eating are recorded on a chart and provided to you at the end of the day. Our infant program has four main goals for your child: to learn about himself or herself and others; to learn about moving; to learn about the world; and, to learn about communicating. Each of these goals has objectives to help you and our teachers evaluate your child’s development. 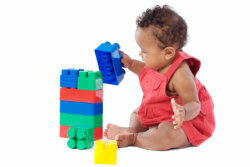 Visit www.Highscope.org for more information on Infant/Toddler Key Development Indicators.